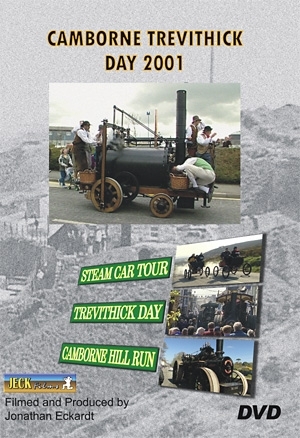 Camborne Trevithick Day is an annual celebration of its most famous son Richard Trevithick, pioneer of high pressure steam, railways, etc, who in 1801 ran the World's first successful self propelled land steam locomotive up Camborne Hill. On this 200th anniversary a full sized replica repeated this feat plus his 1803 London Carriage, the Hancock’s 1835 Steam Bus Replica on its first outing and the original 1875 Granville Steam Carriage, the Steam Car Club tour of Cornwall, a collections of vintage cars and fifty steam engines - the evolution of land transport. A unique video of a historic event. The annual celebration of Richard Trevithick, pioneer of high pressure steam, who in 1801 ran the World's first successful self propelled land steam locomotive up Camborne Hill. On this 200th anniversary a full sized replica repeated this feat. Plus his 1803 London carriage. The Hancock’s 1835 Steam Bus Replica on its first outing. The original 1875 Granville steam carriage. The Steam Car Club tour of Cornwall and visit to a tin mine. A collections of Vintage Cars and fifty Steam Engines.